new value sets at the bottom of this page. 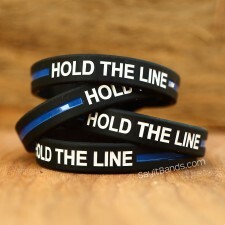 Make a statement and take a stand with our thin blue line wristbands. Each stripe on the emblem represents certain respective figures: the blue center line represents law enforcement, the top black stripe represents the public whilst the bottom represents the criminals. The idea behind the graphic is that law enforcement (the blue line) is what stands between the violence and victimization by criminals of the would-be victims of crime. 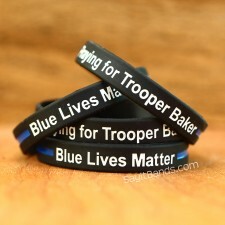 Thin Blue Line items have become popular among law enforcement personnel, their families and supporters. You can order our stock and custom debossed color filled bands below. IN-STOCK DEBOSSED COLOR FILLED BANDS SHIP WITHIN 24 HOURS! We make these bands in bulk and stock them so you can order virtually any quantity you need at a great price. Making these debossed color filled bands is a two-step process. Using high quality silicone, we first we create a debossed (indented) line around the entire band. We then fill that line with the contrasting color. As a result, the completed product has both a dimension and color contrast, and since the thin line is debossed into the band it will stand the test of time and be protected from wear. We stock adult (8") in all styles below and child (7") in many. There are some designs with a very small child (6") and a few where we have XL adult (9") and even XXL biggest adult (10") too. See below for other sizes in selected thin blue line designs. These are some of the most incredible bands we make. 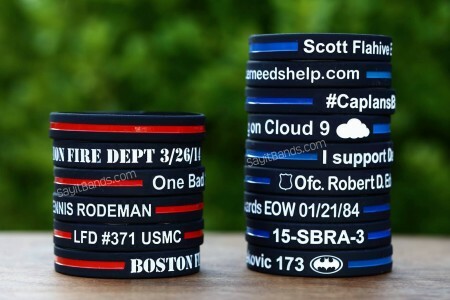 The process is similar to our in-stock bands above but created with your text/images. Since they are debossed first and then the color is added to the debossed (indented) areas they make an amazing impact and they wear very well over time as nothing will rub directly onto the text or line and cause wear. ADULT and CHILD size available. 100 wristbands minimum since we setup a custom mold for these*. the number of orders in the que. need them in a hurry. 50 wristbands for just 1¢. We know that families and groups often have different ages and sizes of people in them so we are offering these value sets where you can choose the breakdown of sizes you need. If your group of 100 has just a few children in it you can choose a small number of smaller wristbands to make sure no one is left out. If you have any questions or need a different set of band designs and sizes send a message to email@sayitbands.com and we will follow up. SEE BELOW FOR SPECIAL PRICING THIS WEEK! Be sure to check out our SILICONE RING page as well for high quality wedding replacement rings at incredible prices!